CPCL asserts facility is in good health. Residents say “The discharge of oil has intensified over the past two years. Industries in India do not have specific department in their setup or do not engage specialist people during the design stage to have a proper corrosion management program. Corrosion control activities are presently attended by other functional groups. 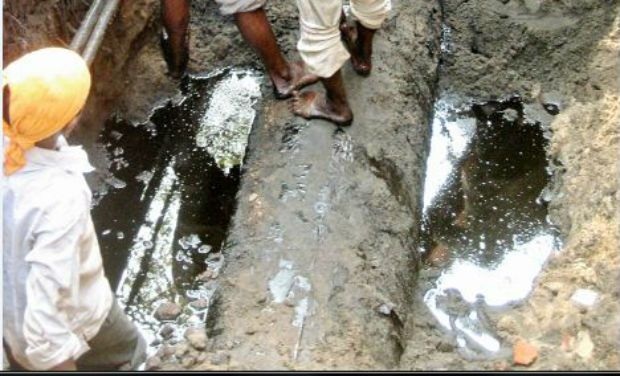 A leak in an underground oil pipeline in Tiruvottiyur on Friday set off panic among residents even as oil company officials initiated immediate action to plug the hole and clear the contaminated soil on Ottravadai Street. While CPCL officials said that the pipeline was being monitored regularly and no abnormality had been detected, TNPCB officials, who inspected the spot, said the leak was due to corrosion. Residents said the leak was first been noticed at 6.30 a.m. By 8 a.m., the area was cordoned off by Chennai Petroleum Corporation Limited (CPCL) with the assistance of the fire service personnel and Central Industrial Security Force. Soon, the excavation of the area began and the workers kept throwing mud on the oil collected in the pit dug up to plug the leak on Ottravadai Street. 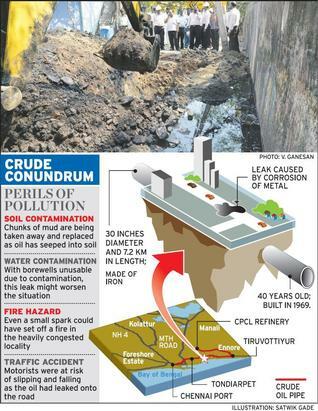 Chennai Corporation Councillor Prabhakaran said the residents have been complaining about the oil leak for the past few months. Many wells and bore wells in the residential locality have been closed because of oil contamination. CPCL officials said the leak had been plugged by evening. As a school was located on the same street where the leak occurred, officials asked residents to avoid cooking or using LPG stove for any other purpose till the hole was plugged. “The discharge of oil has intensified over the past two years. Luckily today, no vehicles skidded on the oil patch,” said S.Damodaran, a resident. The 30-inch oil pipeline runs for a distance of 6.9 km underground and 300 metre above ground level. “The pipeline has been properly assessed for its health periodically. CPCL has been taking extraordinary precautions to periodically inspect the health of the pipeline. The pipeline is protected by impressed current cathodic protection system and monitored every week. Walk-through inspections of the pipeline are done every fortnight. Extensive condition assessment studies of the pipeline are done once in four years and the last exercise was done by Engineers India Limited (EIL) in December in 2012,” a CPCL release said.